Take a tour through the Berkeley campus and hit the highlights of Jewish student life at Cal. You can download the map and take the tour yourself, or contact us and set up a tour that will be led by one of our student leaders. To take a guided tour, email Molly Shapiro at mshapiro@berkeleyhillel.org. 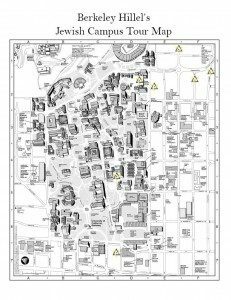 Click HERE to download the Berkeley Jewish Campus Tour map.